Here are the people who have played their part with the band in the past, helping it to achieve the success it has. Ian played trumpet and flugelhorn in various groups in his youth. He recently started to play again in the last couple of years and can often be heard playing jazz and improvising at the Jam Side Up jam nights in Seascale. The sound of the trombone has been compared to the sounds of a fart in a watering can. Jo first became obsessed with this ‘unique’ sound at the age of 6, when she heard the instrument used in ‘Ghost Town’’ by the Specials. Her other obsessions at this age were Adam and the Ants and trying to work out whether Boy George was a boy or a girl. At the age of 12 Jo got the opportunity to learn the trombone. She was told that it was the hardest instrument to learn so, being a little bit contrary, this made Jo more determined to play the trombone. She has ADHD and dyspraxia so learning new skills was usually quite difficult. However, Jo took to the trombone relatively easily; proving that poor co-ordination and a short attention span is an asset for a trombone player. 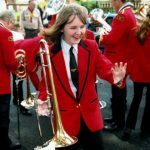 Jo started her playing apprenticeship in her school and local brass bands and this is where she learned the basics important to any good brass musician – tight ensemble work and sarcasm. Unfortunately, mastering these skills was not enough. With the alcohol tolerance of an anaemic piccolo player, an inability to march in time and the small matter of not wanting to look like an NCP car parking attendant, Jo knew she was destined to take her trombone elsewhere. Big bands first came calling at 20 when Jo joined the Lancashire Student Jazz Orchestra with the great musical director Stuart Grills. Stuart was known and loved by all the students for his enthusiasm, patience and his unique conducting style, known as the ‘funky chicken dance’. During her time with the Jazz Orchestra, Jo toured Belgium and one of the highlights was the lead tenor player managing to get the theme to Rainbow into every solo. Jo studied music at Bangor University but afterwards decided to run away from the circus to become a civil servant. However, she could not stay away from Big Bands. Jo ended up playing lead trombone in a variety of big bands, usually because ‘we’ve asked everyone else’. However, she has always enjoyed bossing about a section and the relationship between herself and the rest of the section has been described as that of a rather stern carer, although Jo prefers to think of it as a benign dictatorship. Jo has recently given up the mantle of lead in order to gain more experience and now plays third trombone but still likes to occasionally make ‘helpful’ suggestions. Her latest suggestion in the La’al Band was to try and present a more uniform look as a trombone section at gigs. Unfortunately, Tim really didn’t have the legs for a dress. Jo lives in Preston but was initially lured north to dep for The La’al Big Band by the Cumbrian friendliness. But now as a permanent member she now has no escape. They occasionally let her out to play with The Managers Big Band, Lou and the Llamas and Fylde Sinfonia Orchestra. Fergus started playing the trombone at the age of 8 and joined in the music making with the rest of his family. When he joined Ulverston Victoria High School he was taught by Tim Lysons (1st Trombone) and joined all the bands possible including the wind band. With the wind band he had the joy of going on tour to Italy, Belgium, the Czech Republic and France. Also, while at school, he joined the Ulverston Town Band, Blast Furness and performed in other semi-professional gigs. At the age of 18 he picked up his trombone and went to Birmingham. He spent 3 years trying to play the trombone and drinking, also known as University! Again, he joined every band at university where he became principal trombone for the University playing with the big band, orchestras and operas. Now back in Cumbria, trying to find a job, Fergus is playing where he can with Ulverston Town Band and of course The La’al Big Band. Nev has been playing drums since the age of ten (a long time!). He has a Diploma in Commercial Music and won the John Millot award for best drum student whilst at college. Nev has played with a wide range of musicians playing a wide range of styles, everything from heavy metal and blues to be-bop and jazz fusion, but jazz of all types is closet to his heart. His first ever paid pro gig was playing with a jazz trio in the Grand Hyatt Hotel in Hong Kong. He has played with Marni Rice (New York based singer) and Kenny Baker (jazz trumpet) among others. Nev released an album and toured with the Serious Hat Band for a while in the mid 1990s – in fact, he probably has the only remaining copies of the CD left! His influences range from Peter Erskine and Vinnie Coliauta to Steve Gadd and Buddy Rich, who he was lucky enough to meet in 1986, shortly before Buddy died. Jenn began playing the flute and piano (though not both at the same time!) at the tender age of eight. By the time she reached her teens she had progressed to playing alto sax, tenor sax and clarinet. She has even been spotted playing baritone sax on the odd occasion so she’s what we in the business call a bit of a smarty pants! Away from The La’al Big Band Jenn plays in various local groups and at amateur dramatic shows throughout the county. She claims to have no particular musical influences and just says, “If I like it, I like it and that’s that!”. Jenn says she is enjoying the challenge of playing the jazz chair in The La’al Big Band and learning, what is for her, a new style of music. Peter hails from St Bees but is still really a newcomer, having only been there since 1984. He took up the sax in 2006 as a retirement hobby and soon converted the hobby into an obsession. He now runs a jazz improvisation workshop and is musical director of the local jam club. He’s played alto sax in a small combo and still plays alto in a wind band as well as singing in a local choir. Not only did he come late to sax playing but also to jazz. In his teens he dabbled with a guitar and, to help date that, his influence at the time was The Shadows. He’s now trying to catch up with a broad diet from Miles Davis, Bird and Trane, through Charles Mingus and Art Blakey, the royals Basie and Ellington to Dave O’Higgins and Itchy Fingers. Rob started playing clarinet at the age of 12. He progressed quickly and soon became interested in playing the tenor saxophone. Rob says that in order to get one it was a toss-up between an instrument and a new lounge carpet. The instrument won and Rob hasn’t looked back as he now plays all the saxes, clarinet and bass clarinet. Rob has re-joined the band after a year off to become a dad. No prizes for guessing where the inspiration for his son’s name, Harry James, came from! When he’s not playing with LBB Rob lends his support with sound and lighting at various amateur dramatic shows. Rachael comes from West Cumbria and attends sixth form at Cockermouth School. She has been playing since the age of eight, originally starting as a cornet player in brass bands before moving on to trumpet. Rachael now plays in a range of different ensembles including Papcastle Community Orchestra, Music Masters Big Band, West Lakes Wind Band, Cumbria Youth Orchestra and various school events and was also recently given the opportunity to play with the RAF Squadronaires on their recent visit to the North West, which was a treasured opportunity. Rachael will be leaving the band later this year to continue her studies at Birmingham Conservatoire of Music and hopes to pursue a career in music in London’s West End, which she regularly visits to see shows and attend the BBC Proms. She enjoys listening to a wide variety of music from jazz, including Wynton Marsalis and Gershwin, to artists such as Alison Balsom at the opposite end of the spectrum. Henry is from the South Lakes and has been playing brass since he was 10 – five years of trumpet then a quick change to trombone for the last two years. He plays in Ulverston Town Band, many school bands and also a self-run jazz quintet with his friends. He has played principal trombone at the Queen’s Garden Party and three times with the Royal Marines Band Service. Roger was born “durin’ the wa-r”. His father used to play piano with Nat Gonella in a services jazz band and his uncles used to play boogie woogie on grandfather’s piano and all the extended family sang, so all the ingredients were there for a future involved in music in some way. At the age of 14, Roger took up the guitar and by the age of 18 he had his own rock and roll quartet imaginatively called ‘Just Four’. He earned his first money from music in 1960 and what with one thing and another is still earning money now. He has been in pop and jazz groups and dance bands continuously since 1960 playing guitar, bass and, by his own admission, terrible piano and is also a solo singer/guitarist. If any of this great longevity sounds in any way impressive, much of the aforesaid five-and-a-bit decades spent as a semi-professional musician doesfall into the category of ‘earn-while-you-learn’.